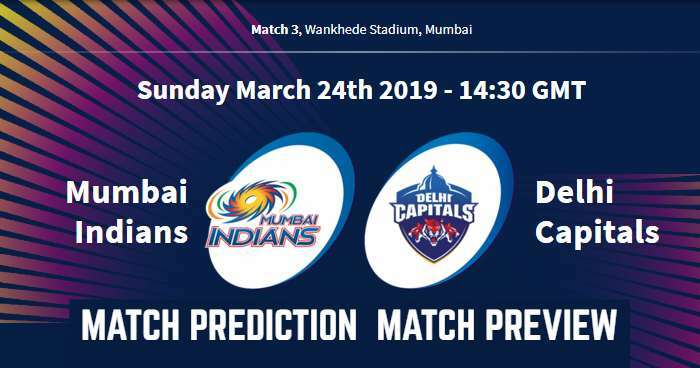 Home / DC / Delhi Capitals / IPL / IPL 12 / IPL 2019 / IPL 2019 Match Preview / MI / Mumbai / Mumbai Indians / Wankhede Stadium / IPL 2019 Match 3 MI vs DC Match Prediction, Preview and Head to Head: Who Will Win? IPL 2019 Match 3 MI vs DC Match Prediction, Preview and Head to Head: Who Will Win? Mumbai Indians (MI) will take on Delhi Capitals (DC) in the 3rd Match of the 12th season of Indian Premier League - IPL 2019 at Wankhede Stadium, Mumbai. Delhi Capitals will play their maiden in their new name as it was renamed to Delhi Capital from Delhi Daredevils. As far as weather is concerned, the temperature will be around 30°C with humidity above 40%. There is a fair bit of grass covering, it means that the seam bowlers will get the ball to move a bit. It will come on to the bat nicely, should be plenty of runs on this surface, a typical Wankhede pitch. The Mumbai Indians won the IPL title in 2013, 2015 and 2017, and the owners and since the time Rohit Sharma has taken over Mumbai Indians' captaincy, winning the title every alternate year. Delhi Capitals are yet to win their maiden IPL Trophy; recently rechristened as part of a partial change in ownership may bring them new luck and pave way for their maiden IPL title. Mumbai Indians have retained most of their squad from last season and also added experience with including Yuvraj Singh and Lasith Malinga. However, Lasith Malinga was Mumbai Indian bowling mentor in last season. Delhi Capitals have mostly retained their young and talented cricketers from last season and also grabbed experienced players in IPL 2019 Auction. Retaining Rishabh Pant, Prithvi Shaw, Avesh Khan, Manjot Kalra and Sandeep Lamichhane. Mumbai Indians (MI) and Delhi Capitals (DC) have played 22 matches against each other in Indian Premier League (IPL), out of which Mumbai Indians won 11 matches and Delhi Capitals managed to win 10 of those. In the last five matches, Delhi Capitals have only won 2 matches, on the other hand, Mumbai Indians won 3 matches. In last season of IPL (IPL 2018), Delhi Capitals won both matches against Mumbai Indians. At Wankhede Stadium, Mumbai; MI and DC have played 9 matches against each other out of which MI won 7 matches and DC won only 2. Toss will be an important factor; as dew will come into play later in the match, the toss-winning captain would like to bowl first. A 190+ total will be a good score to defend on this pitch but looking but it depends on the dew factor which will come into play later in the match. 200+ score can also be scored here in the first inning. Mumbai Indians look more settled as a team but is more relied no Rohit Sharma. On the other hand, Delhi Capitals will tier to find their winning combination as they had made many changes to their squad. In our prediction, Mumbai Indians have a strong hold on this match and are likely to win. Playing XI for DC: Shreyas Iyer (c), Shikhar Dhawan, Prithvi Shaw, Rishabh Pant (wk), Colin Ingram, Keemo Paul, Axar Patel, Rahul Tewatia, Kagiso Rabada, Trent Boult, Ishant Sharma. MI Squad for IPL 2019: Rohit Sharma (c), Anmolpreet Singh, Jason Behrendorff, Jasprit Bumrah, Rahul Chahar, Ben Cutting, Quinton de Kock, Ishan Kishan (wk), Pankaj Jaswal, Siddesh Lad, Evin Lewis, Mitchell MchClenaghan, Lasith Malinga, Mayank Markande, Adam Milne, Hardik Pandya, Krunal Pandya, Kieron Pollard, Rasikh Salam, Anukul Roy, Barinder Sran, Aditya Tare, Jayant Yadav, Suryakumar Yadav, Yuvraj Singh. DC Squad for IPL 2019: Shreyas Iyer (c), Kagiso Rabada, Chris Morris, Bandaru Ayyappa, Sandeep Lamichhane, Colin Munro, Ishant Sharma, Colin Ingram, Trent Boult, Shikhar Dhawan, Manjot Kalra, Nathu Singh, Sherfane Rutherford, Prithvi Shaw, Rahul Tewatia, Ankush Bains (wk), Avesh Khan, Axar Patel, Rishabh Pant (wk), Harshal Patel, Keemo Paul, Hanuma Vihari, Amit Mishra, Jalaj Saxena.